Dr. Deborah Milligan is a pulmonologist in Long Beach, California. Dr. Milligan gets her diploma in medicine from University of Virginia School of Medicine, in 1991. The internship was completed in 1992, at University of California Davis Medical Center, and residency in 1994, at the same medical center. 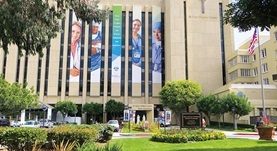 She practices medicine in California; being affiliated with St. Mary Medical Center, in Long Beach, California. American Board of Internal Medicine certified Dr. Milligan in internal medicine and critical care medicine.